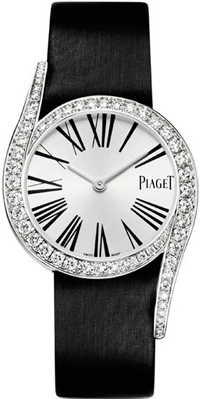 Piaget Limelight Gala departs from absolute linearity by two elegantly rounded ears. With restrained styling body perfect harmony concisely designed dial. The silver disk allocated large Roman numerals and central hands indicating hours and minutes. Case diameter 32 mm made of 18-carat white. Give a special charm to watch brilliant-cut diamonds that adorn the bezel with curved inserts (62 diamonds weighing approximately 1.8 K). New created based on quartz movement Piaget 690P. Created another version of the Limelight Gala Ref. G0A38164, different from the previous precious loose. All elements of hours since the dial and ending clasp bracelet studded with diamonds. In total, the decoration was used 679 diamonds, of which 228 to a total weight of 1.1 – on the dial, and 451 weight 16.4 K – on the bracelet.